where <Plesk server's address> is either the domain name or the IP address of the Plesk server. Type in your username and password to log in. When you are logging in to Plesk for the first time, the scenarios will differ depending on whether you are a shared hosting customer, or an administrator managing your server. Power User view. 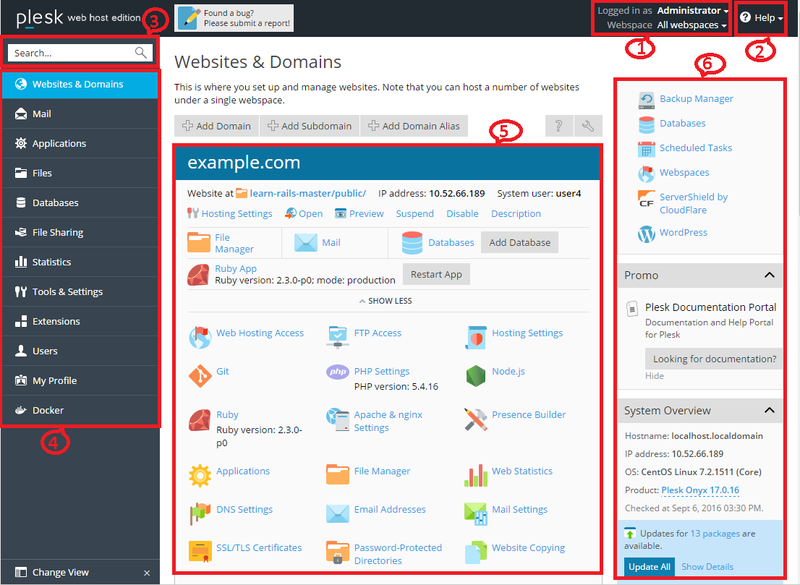 Choose this interface if you are a web admin managing your customers's websites. This section contains a mix of various miscellaneous controls and information displays for users' convenience. Set the settings such as the server's host name, statistics calculation preferences, and others. View the options and features provideby d by your license. Order and install license keys for Plesk and its add-ons. Caution: If a subscription is suspended, all domains associated with it become unavailable and the owner is unable to manage the subscription until it has been activated by the provider. If you find that your subscription is suspended, contact your provider as soon as possible to resolve the issue.